Deficiency of zinc (Zn) in soils and crops of the world is established fact. There is need for application of Zn application and growing Zn-efficient crop genotypes to tide over the situation. However, information pertaining to application of Zn to Zn-efficient and Zn-inefficient crop genotypes grown in field condition on plant enzyme (wherein Zn is a co-factor) activities is limited. To investigate the influence of different Zn regimes on superoxide dismutase (SOD) and carbonic anhydrase (CA) activities of Zn-efficient and Zn-inefficient wheat genotypes, the present study was carried out comprising three each of Zn-efficient and Zn-inefficient genotypes of wheat grown under field experiment with four Zn treatments such as no Zn, soil Zn, foliar Zn, and both soil and foliar Zn. Application of Zn (soil/foliar/both) enhanced SOD and CA activities of both Zn-efficient and Zn-inefficient genotypes at pre- and post-anthesis growth stages of wheat compared to no Zn. Under no Zn, SOD activities were higher in both Zn-efficient and Zn-inefficient genotypes at post-anthesis stage; however, reverse was true for CA activities. Application Zn enhanced Zn concentration in leaves, stem, and grain of both Zn-efficient and Zn-inefficient genotypes. Grain Zn concentration increased by 25.1, 35.7, and 38.2% with soil, foliar, and both soil and foliar applications of Zn, respectively in Zn-inefficient genotypes and by 7.2, 21.1, and 30.6% with soil, foliar, and both and foliar applications of Zn, respectively in Zn-efficient genotypes, compared to no Zn. In Zn-efficient genotypes, SOD and CA activities contributed about 63 and 77% towards grain Zn concentration, respectively, whereas SOD and CA activities contributed about 50 and 66% towards grain Zn concentration, respectively in Zn-inefficient genotypes. 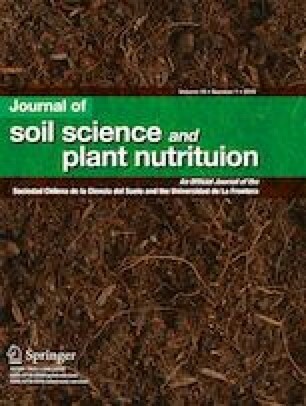 The results indicated that both soil and foliar applications are needed for enhanced SOD and CA activities and plant Zn concentration in wheat. Physiological utilization of Zn plays an important role in Zn efficiency of wheat genotypes. The authors thank the Director, ICAR-Indian Institute of Soil Science, Bhopal, Madhya Pradesh, India, for providing the facilities to carry out the research work. The authors also express their gratitude to the editor and the anonymous reviewers for their suggestions to improve the manuscript. The study was funded through National Agricultural Innovation Project (NAIP) (sub-project code: 417801-08) of Indian Council of Agriculture Research (ICAR), New Delhi.